Commonly used as preservative in food, drugs, and cosmetics. Its antifungal activity has been compared to ciclopiroxolamine and sulconazole, mainly used in onychomycosis treatment and dermatophytes. Use of caryophyllene oxide as an antifungal agent in an in vitro experimental model of onychomycosis. Caryophyllene oxide isolated from the rhizome of Formosan Gynura japonica was shown to exhibit significant anti-platelet aggregation activity in vitro. 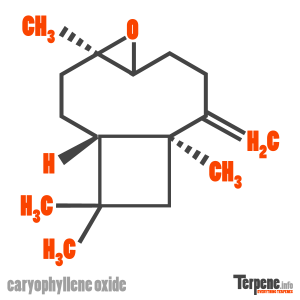 Read through our forum on Caryophyllene Oxide below, or start your own topic. This forum contains 492 topics, and was last updated by Lillysom 5 hours, 19 minutes ago.